Forty-five minutes after walking in to his optician for a routine eye examination Terry Arber (62) was sitting feeling completely “stunned” as his optometrist, Gordon Ilet, explained that what Terry describes as a “grass stain” on his retina was in fact a tumour. Melanoma diagnosis Terry was swiftly diagnosed as having a melanoma the size of a pea (6mm) inside his left eye, and, despite having read some “horror stories” on the internet, Terry was reassured by Mr Hungerford that his chances of survival and retaining his vision were extremely good. Clean bill of health He has now been given a clean bill of health but will continue to have six monthly blood tests to check the tumour has not spread. About ocular melanoma Ocular melanoma are rare – approximately 500 new cases are diagnosed in the UK every year. 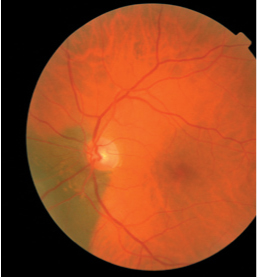 The incidence on ocular melanoma increases with age.